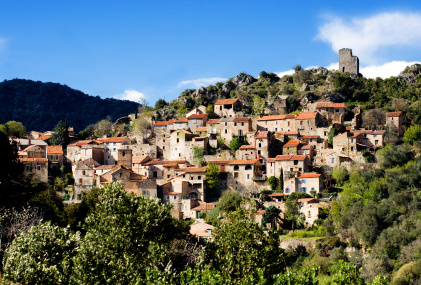 The Languedoc-Roussillon is one of France's three Mediterranean regions, along with Provence-Alpes-Côte-d'azur and Corsica. It was formed from the historical provinces of Languedoc (meaning 'Oc language', i.e. 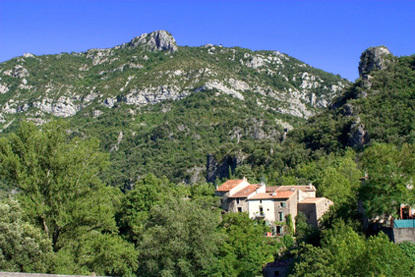 Occitan), Gévaudan (the present-day Lozère département), and the five Catalan 'countries' (Roussillon, Vallespir, Conflent, Capcir, and Cerdagne) that are now simply referred to as Roussillon. Languedoc is divided in limestone plateaux and national parks of Upper Languedoc, and the vineyard-filled plains of Lower Languedoc, where three main cities (Montpellier, Nîmes and Carcassonne) are located. Occitan, a Romance language halfway between French, Spanish and Italian, is still widely spoken, or at least understood, by a large part of the population, despite efforts of Paris to suppress it since the 16th century. Roussillon was part of Catalonia until 1659, and is both French and Catalan-speaking today, keeping strong ties with their fellow Catalan speakers across the Spanish border. Some Spaniards, especially Catalan nationalists, like to refer to Roussillon as 'Northern Catalonia'. Perpignan, the largest city in Roussillon, was the continental capital of the Kingdom of Majorca in the 13th and 14th centuries. Languedoc-Roussillon is the single biggest wine-producing region in the world, being responsible for more than a third of France's total wine production. Until a few decades ago most of the wine produced was cheap table wine, but following a deep restructuration the region is producing wines of increasingly good quality. The best appellations are Corbières and Minervois. Produced since 1531, the Blanquette de Limoux is the world's oldest sparkling wine. Regional culinary specialities include cassoulet (a casserole of meats and white beans), bourride (a kind of bouillabaisse), brandade (an emulsion of salt cod and olive oil), tielle (squid or octopus pie), and fougasse (a flatbread similar to focaccia). No other region plays more rugby in France than Languedoc-Roussillon. Bullfighting is a popular spectator sport, especially in Nîmes, though the bulls are not put to death like in Spain. Corridas even enjoy legal protection in areas where there is an uninterrupted tradition. Famous people from the Languedoc-Roussillon include (chronologically): the entrepreneur Pierre-Paul Riquet (who built the Canal du Midi), the novelist Alphonse Daudet, the WWI general Joseph Joffre, the Nobel Prize chemist Paul Sabatier, and the singer Georges Brassens. 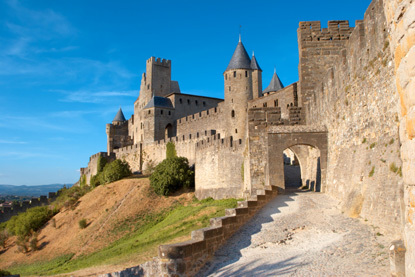 Carcassonne is probably Europe's most famous fortified town. A stronghold of Occitan Cathars in the 13th century, the fortress was restored in 1853 by the Gothic Revival architect Viollet-le-Duc. 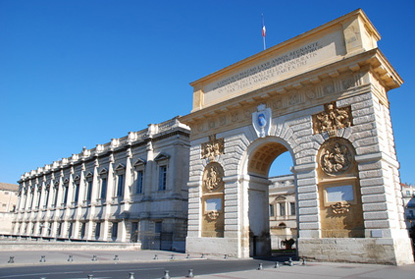 Capital and largest city of the Languedoc-Roussillon, Montpellier is a modern university city and the fastest growing city in France. Montpellier is renowned for its neoclassical architecture, its museums and festivals, and the country mansions (or "follies") built by wealthy merchants in the 18th century. 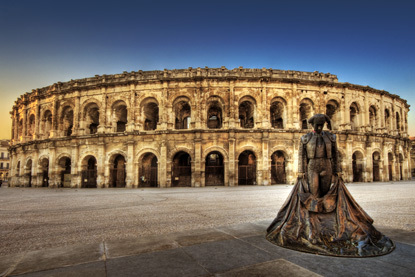 Nîmes was one of the most important cities in Roman Gaul and possess a rich heritage of ancient Roman monuments. The exceptionally well preserved Roman amphitheatre, sitting 25,000, is still used for spectacles. The Maison Carrée is the only complete Roman temple outside Italy. 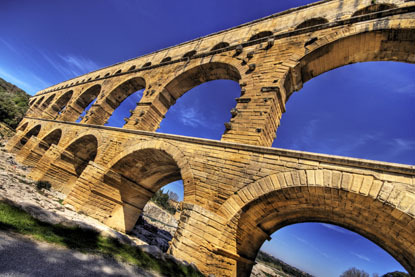 Constructed across the Gard River, the Pont du Gard is the world's second best preserved ancient Roman aqueduct bridge (after Segovia). It was added to UNESCO's list of World Heritage Sites in 1985. 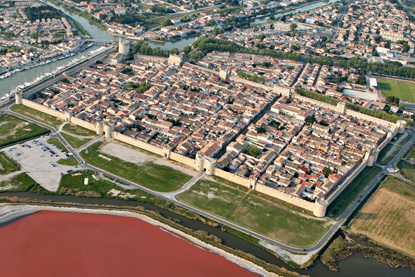 Aigues-Mortes is a medieval fortified town in the Camargue Regional Nature Park. It is flanked by bright red salt evaporation ponds.